1. 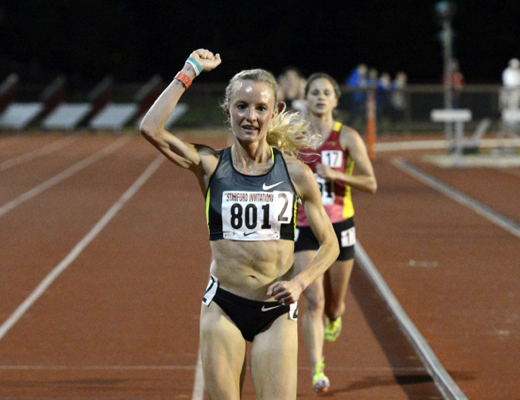 Daily Relay: You had a strong run at the USA 20k Championships on Labor Day in New Haven. 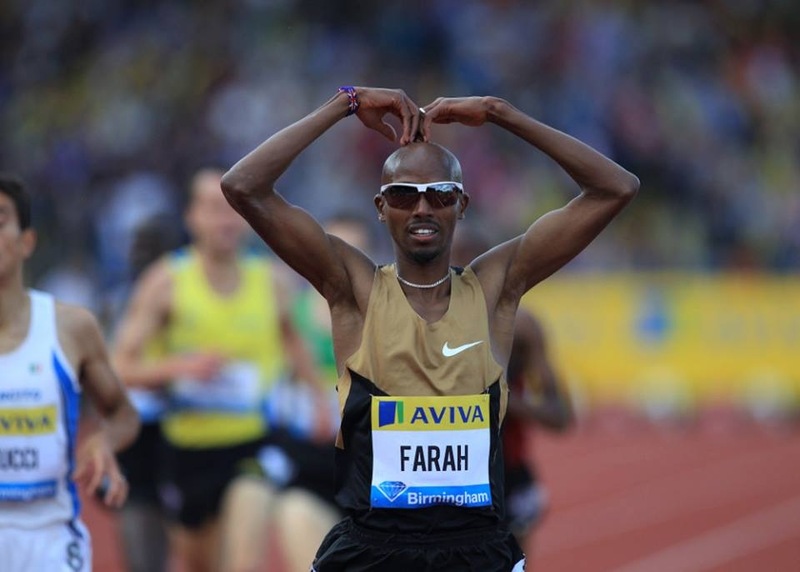 Were you pleased with the result (1:01:28 for 6th)? Do you have any more tuneup races before NYC? 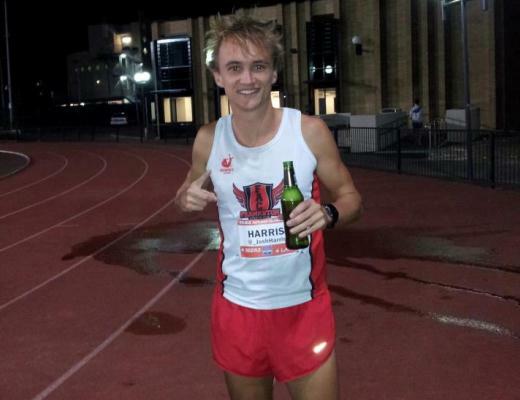 Jason Hartmann: I don’t think I ran as smart as I should have, however, given the stage of marathon training I am in, I was pleased with it, given my lack of sharpening. 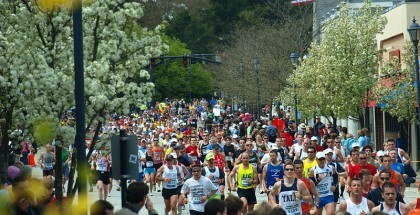 The New Haven 20k is a great race, but it wasn’t the focal point of my training this year. I felt strong given the high focus I’ve put into hill work, tempos, etc, but I didn’t feel sharp the way you do after intervals at faster paces. The race accomplished what I needed, especially given that I coach myself–it gave me feedback as to what components I have to start including at this stage of my training in order for me to be ready when it counts on November 3rd. I’ll receive more feedback data from how my tweaks in my training adapt and further my fitness at Chicago, where I’ll be pacing. 2. Daily Relay: Speaking of NYC… You were scheduled to run last year when the race was cancelled. How big of a hit did you take for not being able to earn your living in that race? Has anything changed sponsorship-wise for you? Jason Hartmann: Emotionally and financially, it was a tough hit. Every person, no matter how fast they are or how many years they’ve trained in this sport, gets let down or frustrated when something they’ve invested so much time, emotion, energy, and sacrifice into gets taken away, and for a reason that you can’t even be angry at! The chance to not only earn a living on that day, but the lost opportunity for potential sponsorship also hurts. I remain unsponsored at this time, however, I can’t thank local sponsors enough, such as Boulder Running Company, that sponsored me shoes and gear from my first Boston Marathon to my last Boston Marathon. I also have to thank RallySport Boulder for their continued loyalty and sponsorship– RallySport is the place to train if you’re serious, elite, competitive, and want that atmosphere in a gym. It’s such a nice facility, and the elite runners of Boulder are so fortunate to have their sponsorship to use their treadmills when it snows, gym to lift and do injury prevention work and core, and bikes/ellipticals/EFX’s to cross train with. 3. Daily Relay: Your PR currently is from Chicago 2010, where you ran a 2:11:06 on a hot day. Would you consider that your best Marathon so far? 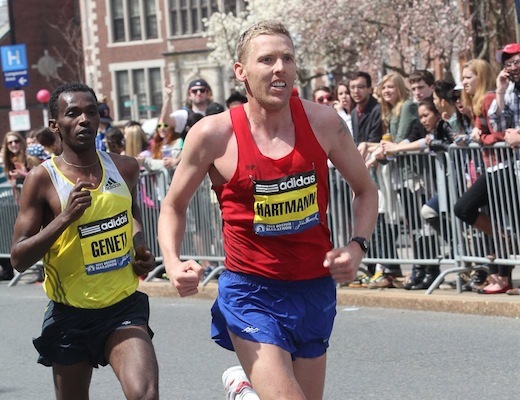 Jason Hartmann: I consider my best marathon the Twin Cities Marathon in 2009. In 2007, Coach Brad Hudson helped guide me to a 10th place performance at the US Olympic marathon trials, a PR at that time, and then I had a great spring of training and racing, where I podiumed at the US 8k Championships for 3rd, just behind Jorge Torres and Andrew Carlson. I was qualified in the 10k for the US Olympic Track Trials, and given that I was living in Oregon, everyday that got closer to the Trials, I got more and more pumped up. Eugene is Track Town USA, and everyone knew it was coming. The excitement was building. Three weeks before I would have toed the line at the trials, I was limping, running through large amounts of pain in the top of my foot and lower tibia. Two and a half weeks before the gun went off, I was in a boot, diagnosed three stress fractures. I was distraught, and everywhere I looked, I couldn’t forget about the fact that the trials were approaching, and I would no longer be a part of it. Emotionally, it was just too hard to stay in town, and so I packed up my things, with my rottweiler (Maximus) in the front seat, and left my coach, left some close training partners and friends, and drove to Boulder. I moved in with Jorge Torres and took to cross training like hard, biking up canyons in a boot, and doing everything I could to come back. I was in that boot for 12 weeks, and when I was finally able to run on land, the times were not pretty. I started training with Jorge Torres under Coach Steve Jones, and little by little, put one foot in front of the other, and started to come back. So many people told me that my career was done, and that I should just transition into other things, that I started to feel that no one believed in me except a small handful of close friends and former/current coaches. To rebound from that to not just place, but to WIN Twin Cities, set a personal best time, and to beat an international field boasting personal best times 3, 4, 5 minutes faster than me. 4. Daily Relay: Last year, you paced your high school teammate and friend, Dathan Ritzenhein, to his breakthrough PR in Chicago. You both qualified for Foot Locker nationals your senior year where you were 4th and Dathan was 8th (as a sophomore). What was it like training with him then and over the years? Jason Hartmann: It was great in high school to have someone who was constantly pushing me to get better versus rest on my laurels. I had some natural talent when I was younger, so I didn’t learn as much from races as I did in college or as I do now. What I mean by that is, as a sophomore, I could have had a bad race, but a bad race for me still meant I won the race, even if I ran a “bad time” for me, or didn’t run smart. Having someone come in who was so fast and so dedicated early on pushed me to keep pushing my limits in practice as well as in races. It also forced me to develop leadership skills. We were always close whether it was picking him up everyday in my car to drive him to practice or hanging outside of practice. Dathan is one of my favorite people to run with and to train with, on the track, on an uphill tempo, wherever it is. I always look forward to if we both go home to visit family in Michigan, getting in some training runs and workouts together. Sometimes I go visit him or train with him if I need to do a week or two at sea level to rest from continued altitude training. Dathan is someone who I respect at the highest level, and someone who (since I coach myself) I respect enough to look at the training I write for myself, and ask for constructive criticism and feedback. We have trained enough together through the years, and have known each other long enough that we can be honest with each other. Dathan is one of the toughest individuals I know, and he’ll never give up, and I love training with people like that, who aren’t scared to hurt, who aren’t scared to grind day in and day out. I also like training with him, though, because after the workout is done, we don’t have to talk about running anymore, and we can be friends outside of running. His daughter calls me Uncle J, and our dogs are best friends, and we can talk about everything else, and our identity as runners doesn’t matter–we’re just friends no matter how a race played out. 5. Daily Relay: You have been training in Boulder, CO. How long have you been there and what is it about that area that makes is such a mecca for runners? Jason Hartmann: I trained in Boulder on and off from 2005-2007. As I mentioned, I have been a full-time resident of Boulder, Colorado since July of 2008. The culture of the Boulder community as well as the legacy of those who have come before is what makes Boulder such a mecca for runners. Every kid grows up wanting to run the Bolder Boulder 10k someday, at any level, just to participate. Attend the Boulder Running Company Fun Run on any Wednesday night of the year, and you’ll be running with 200 other individuals of every age, level, and ability surrounding you! I like going to RallySport Boulder to be surrounded by other people with fitness goals for every sport you can imagine–rock climbing, swimming, skiing…In the summer, EVERY Thursday night, there’s a race going on, whether it’s an all-comer track meet or a downtown race series…and the streets are lined with fans, and it’s just great. Boulder also has a strong legacy for those who have trained here: Frank Shorter, Alan Culpepper, Adam Goucher, Kara Goucher, I mean the list goes on and on and on… think of all the former greats that continue to live and serve the Boulder community here (Mark Plaatjes) to great coaches whose presence offer Boulder a special something (Brad Hudson, Steve Jones). When you train somewhere, in some small way, you also train on the stomping grounds of all the greats that came before you, and you feel a sense of camaraderie because of that. There’s a sense of legacy to carry on.